The Heavens Mountain Escape is an exclusive, secluded retreat, located at the base of the escarpment that surrounds the beautiful Kangaroo Valley. Consisting of only three private spa cottages, situated on a 160-acre property, The Heavens offers guests an unrivalled view of the valley below.The Heavens is ideal for that romantic getaway, or a relaxing holiday with friends.You can spend your time here relaxing and taking in the magnificent view, or you could partake in one of the many activities in and around Kangaroo Valley.Each cottage has been situated to offer guests maximum privacy whilst still taking full advantage of the spectacular views of Kangaroo Valley. "Elysium" cottage has two bedrooms, and is designed for either one couple, 2 couples or a family of 4. It offers queen-size beds in both bedrooms, a deep oval freestanding spa bath, digital TV, surround sound home entertainment system, iPod dock and DVD player.Children enjoy the room to play away from the other cottages and there is an opportunity to feed the alpacas, goats, free range ducks and chooks and Kevin Bacon the pig. 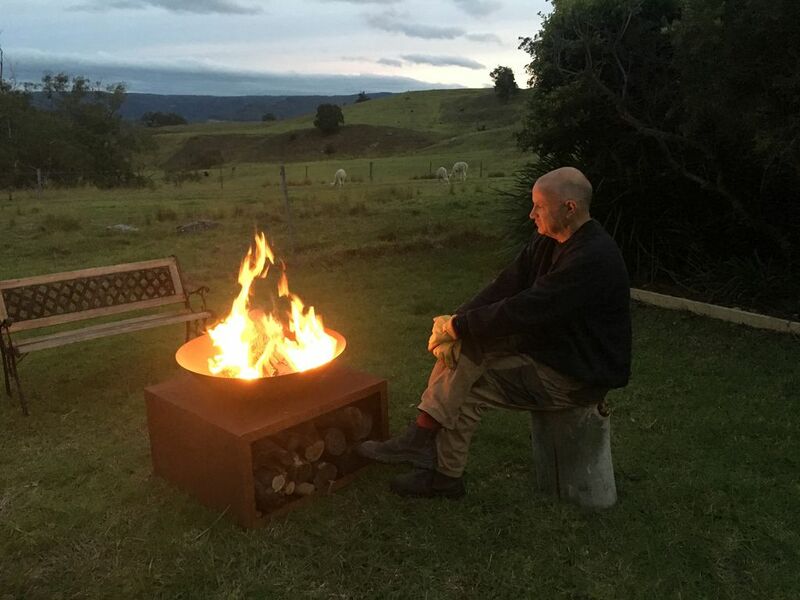 There is a fire pit to enjoy in the cooler months. The cottage is well equipped if you wish to cook for yourself, containing an electric cooktop, convection microwave oven and BBQ - the kitchens also have a fridge, dishwasher and all necessary cooking utensils. Alternately, you may choose to try one of the many restaurants and cafes in Kangaroo Valley village, which is only a five-minute drive away. Should you wish to go further afield on your culinary excursion, the towns of Berry, Bowral and Nowra are all within 30 minutes drive of The Heavens. We can also arrange BBQ packs and a small range of light meals to be delivered to the cottages, with notice.For the ultimate indulgence, why not enjoy a relaxing in-house massage during your stay. Bookings are essential. Location The Heavens Mountain Escape is located on the northern end of Kangaroo Valley, only five minutes drive from the village. Tariffs Midweek (Mon-Thu) $250.00 per night for a couple Weekends/Public Holidays (Fri-Sun) $315.00 per night for a couple Weekly (7 nights or more) $265.00 per night for a couple Additional guests $50.00 per person per night. Local Attractions There are many things to do in and around Kangaroo Valley. Canoeing, tennis, horse riding, swimming, golf, bushwalking and shopping are all activities that you can enjoy nearby. Alternatively, you can enjoy a leisurely stroll around the property, making sure to introduce yourselves to the abundant wildlife.We are also within a 45 minute drive of the Southern Highlands, golden beaches of the Shoalhaven, wineries, and the dolphins at Jervis Bay. This property is not to be used for commercial purposes without the express permission of the property owner. Wombats, kangaroos and echidnas wander around the property as well as our friendly alpacas and goats. Kevin Bacon our pig is a highlight. Children and help feed the animals in the morning. Thought our date rate was too expensive for our property. The shower pressure needed to be fixed as it didn’t have any pressure. The shower pressure is now fantastic. Our beautiful new bathroom renovation was let down a wee bit by one of those stupid water flow inhibitors in the shower rose, all good now. Our nightly tariff compares very well with other properties in Kangaroo Valley with similar sensational views and privacy that our guests enjoy at the Heavens. So homey and perfect location ! We stayed here for a wedding that we had in the valley. So glad we chose to stay here! Very private and so cosy! Thought the drive into town would take a while but was so easy! Definitely be staying here again- and that view !! We had a lovely time at The Heavens, beautiful location. Loved having the animals around. Great home base to explore the region. The only issue was having a shared dual-entry bathroom which could be a little uncomfortable for two couples, but would be fine for a small family. Excellent hospitality from Jan. Highly recommended! My husband and I had a very relaxing time at Elysium for a week away from the hustle of Sydney. It was just what we needed. Total peace and quiet out in nature, with only animals and gorgeous scenery for our neighbours. The cottage had everything we needed and was very comfortable with beautiful views from every window. Exceptional property and beautifully decorated and equipped cabin. Our stay at Heavens/Elysium made perfect by great weather, astounding surrounds and mobile spa treatments by local business 'Pamper-Me'.A great way to approach 2013! We had a lovely stay in pleasent accommadation in a beautiful location.